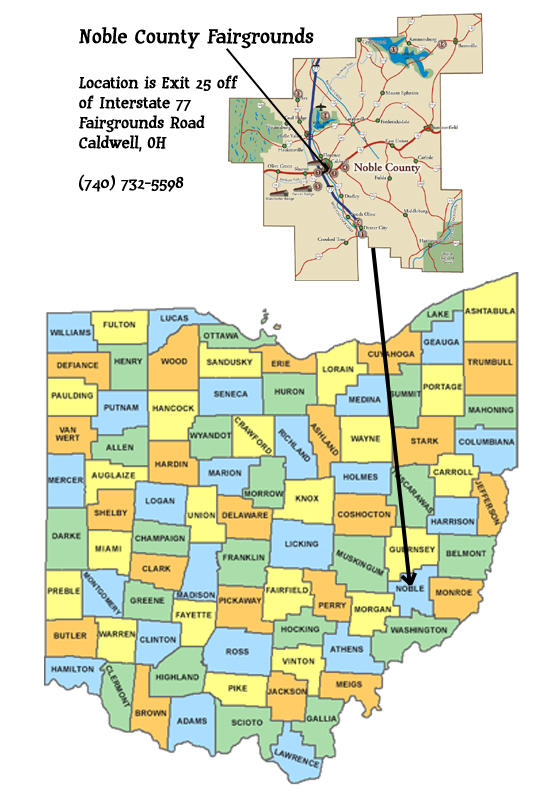 How do you get to the Noble County Fair? Take State Route 78 west to Caldwell. Right on Fairgrounds Road. Noble County Fairgrounds is located on the left side of street. Take State Route 78 east to Caldwell. Left on Fairgrounds Road. Noble County Fairgrounds is located on the left side of street. Take I-77 north to exit 25. Turn right onto State Route 78. Turn left onto Fairgrounds Road. Noble County Fairgrounds is located on the left side of street. Take I-77 south to exit 25. Turn left onto State Route 78. Turn left onto Fairgrounds Road. Noble County Fairgrounds is located on the left side of street.